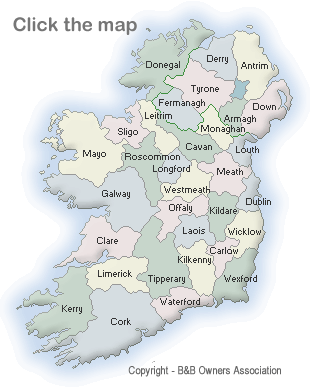 Ireland has 32 counties, Derry, Antrim, Down, Tyrone, Armagh and Fermanagh are in Northern Ireland. Ireland is a beautiful country and every county has something to offer the visitor. The B&B Owners Association's Network of B&Bs in Ireland provides accommodation wherever you decide to visit - CLICK the map to list B&Bs for any county. Staying at an Irish Bed and Breakfast (B&B) or Family Home is part of the experience of visiting Ireland. It brings you closer to the people, their culture, traditions and the genuine Irish hospitality.